Halfling's Luck: What is White Star? Over a Pint and a Pipe! I've been humbled by the response when I announced White Star: White Box Science Fiction Roleplaying. 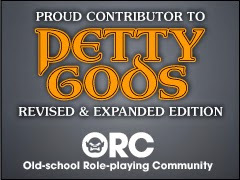 I hoped folks would like it, but the OSR community has just been filled with excitement over this product and that's an awesome feeling. That excitement has lead to a lot of questions about the exact nature of White Star. I'm going to try to address a few of those questions. When is White Star being released and in what formats will it be available? White Star will be available as a PDF as well as digest-sized softcover and hardcover print-on-demand purchase through RPGNow and DriveThru RPG. The price point on these hasn't be determined yet. Release is planned for the PDF to be available in May, with the print versions to be available a few weeks later. This might get pushed back to June, but right now we're on schedule for a May release. Is White Star more of a space opera, hard sci-fi, or exploration science fiction game? The implied tone is one of sci-fi pulp, but White Star is like Swords & Wizardry WhiteBox in that it is designed to be a tool kit. The material in White Star can be used to create a science fiction setting that suits your individual group's needs - all in that old school style. Can I play aliens or non-human characters? Absolutely! White Star will feature rules for playing aliens and robots as player characters. How does White Star relate to Swords & Wizardry WhiteBox? White Star is based on the Open Gaming License material found in Swords & Wizardry WhiteBox and uses the same mechanics in play. All classes have d6 hit dice, gain levels, earn experience points, can use descending or ascending armor class and have a single saving throw. In short, White Star is 100% compatible with Swords & Wizardry WhiteBox, with no conversion necessary. A fighter from WhiteBox could blast off in a star cruiser, taking your campaign from the dungeon to the stars in an instant. What kind of new rules will White Star feature? White Star will include new rules for seven new classes, starship combat, cybernetics, statistics for sci-fi weapons like laser pistols - all written with the simple elegance of Swords & Wizardry WhiteBox. What's the default setting for White Star? There isn't one! The galaxy is yours to create! The core book will include a single adventure and a mini sandbox, which will allow referees and players to jump right in! Will there be supplements for White Star in the future? Definitely! There are plans for a supplement providing even more aliens to those already featured in the core rulebook, as well as a few adventures.. There's also quite a bit of brainstorming going on around ideas for starship books, equipment guides, and possibly even a campaign setting. Will White Star be Open Content? Yes! There are some specific portions that are closed content and product identity, but the vast majority of the content in White Star will be part of the Open Gaming License, giving publishers the option of releasing their own products in the future! White Star sounds awesome. Can't wait to see it. Really looking forward to this one! I'm eager to get cracking on the alien section. This sounds fantastic - I am very much looking forward to the release! White Star Release Date Announced!